"Your crew installed motion sensor flood lights and..."
"Bright idea! Eddie works hard!" "Every one was very professional that I dealt with at this..."
When radiant sun energy strikes a roof, it heat the shingles, felt paper and roof decking by conduction, it causes the underside of the decking and the roof framing to radiate heat downward through the attic toward the attic floor. When a radiant barrier is in place most of the heat radiated from the hot roof is reflected back toward the roof and this reduces the amount of heat that moves into the rooms below. 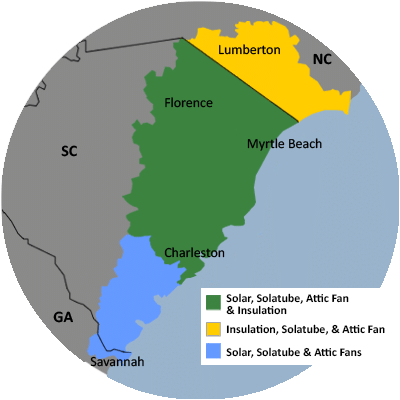 For a FREE no-obligation estimate in Conway, SC, please fill out the form to the right and Carolina Energy Conservation will contact you shortly. 1. I have a 12 X 12 Carolina room that I am interested in having the ceiling insulated. 2. I am interested in having my 2 car garage ceiling insulated. 3. I am looking to have the attic insulation evaluated in my 12 year old house. 4. I have no clue if there is insulation in my craw-space or even if I need it. Interested perhaps in a solar tube or tubes to help light up our living room.would like to see if it could be done and a price. Interested in installing solar panels on home. I'm interested in using solar to reduce my monthly electric bill. HVAC company testing ceiling temps and the readings were high in some areas. It seems we are missing adequate insulation in areas of the attic. Looking to experience additional comfort and energy savings in your home? Carolina Energy Conservation can provide you with a home energy audit to discover what work needs to be done. We offer these services to residents of Conway and nearby. We perform a home energy audit before we make any recommendations about improving insulation and air sealing. Once the evaluation is complete, we take the time to sit down with you to discuss the results and help you make the best decisions for you home and family. Get a FREE Home Energy Conservation Consultation! Better insulation to lower my heat and cooling bills. Newly constructed single family home. Attic insulation appears to be insufficient. Questionable sealing of cracks and wiring holes. This home is presently under construction. I anticipate the closing to be 1/15/18. I am looking for an estimate on installing solar tubes: 2 in the kitchen, one in each bathroom and one in the laundry room, 5 in all. I don't believe they can be installed until after the closing date. We are in the planning stages of a new built home in Rivers Edge Plantation. We do not have a signed contract with a builder, but would like to have the form insulation and trying to make sure it would fit our budget. We hope to start building in May 2018. The house would be 1800 to 2000 Sq Ft 9 Ft ceilings on the main floor, ranch style with a 1000 Sq Ft 10 Ft Ceiling walkout basement. Main floor would have about 560 Sq feet of windows and doors. Basement would have about 210 Sq feet of windows and doors. Any suggestion would be greatly appreciated. Want to insulate garage ceiling/door and install solar powered roof vents. Might also be interested in your solar lighting products.